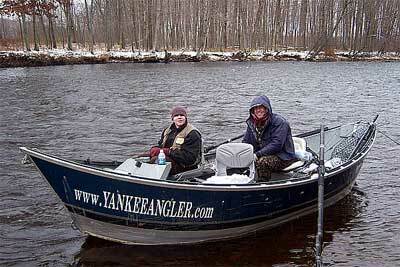 Enjoy a Salmon River guide drift boat fishing trip for Trophy Steelhead or Salmon in Pulaski NY. I’m Randy Jones who has 35 years of Pro. guide fish experience. Join this Salmon River Guide for a drift boat fishing trip on the World Renowned Salmon River in Pulaski NY for hard fighting Salmon or Steelhead during the splendor of our Fall, Winter and Spring fishing seasons. Its reputation for large runs of Salmon and Steelhead and Incredible Average Size of all species is unsurpassed by any other fishery in New England. Whether it is Trophy sized Steelhead or Salmon that you want. This Salmon River Guide is dedicated to introducing both new and experienced anglers to the exciting world of fishing for Steelhead or Salmon. We can Spin fish, Fly fish or Float fish off the Salmon River Guide drift boat. Enjoy learning Advanced fishing techniques and Exact fish habitats. I always enjoy sharing my wealth of knowledge with all my guest’s. Especially if you are planning a return fishing trip on your own. The Steelhead and Salmon fishing of your dreams……. ……..well mak’m reeeeeeeeeeel! 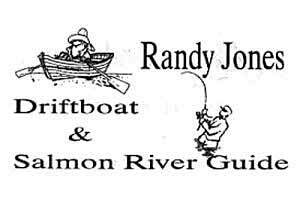 Sincerely, Salmon River guide Randy Jones. 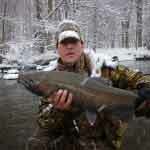 Salmon River Guide fishing for Steelhead, King Salmon, Coho Salmon and Brown Trout in Pulaski NY. Fishing Steelhead with your Salmon River Guide. (avg. 8 to 12 lbs.) – (Nov. thru April.) Our Steelhead are without a doubt, one of the hardest fighting and most acrobatic fish that swims in the Salmon River in Pulaski NY. Torpedo – Silver Bullet runs and changing direction in a blink of an eye. While taking your line 100 to 200 feet out in seconds. This well surely jump start your fishing heart! Tarpon jumps, like a rocket ship 3-4 feet in the air. Somersaulting like a jugglers baton back to earths atmosphere before splash down. Sounding like a cinder block with water spraying 20 feet in all directions. Steelhead Tail Walks across the pool for 40 to 60 feet, will live in your Salmon River memory forever! Our tackle busting King Salmon are known for Rod Breaking EXPLODING fishing excitement! 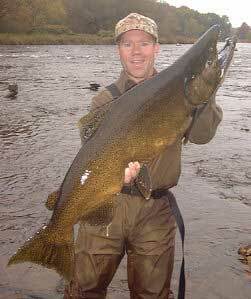 King Salmon will amaze you with their freight train runs on the Salmon River. Its like your hooked to the back of a bus, that isn’t stopping! There is no Nookie like a Chinookie! There is no HO like a Coho, says your Salmon River guide! Salmon River Brown Trout avg. 3-5 lbs. You can catch these Brown Trout anytime while fishing for Steelhead with this Salmon River guide. While they are not as numerous as Salmon or Steelhead. These are an optional Trophy of a Salmon River Fishing life time! A brightly colored up Male Coho Salmon, ready to eat an angler. They get That BIG up here! I took the picture and my client ended up submitting it in a magazine photo contest and won first prize! He kept the BMW and all this Salmon River guide got was this picture. What helps to cause a BIG RUN of Salmon or Steelhead? This might help plan your Salmon River fishing trip. 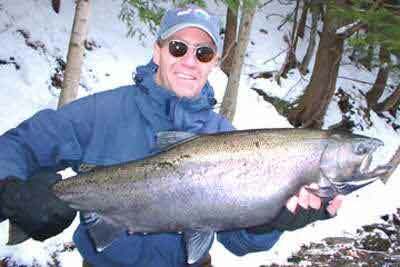 FOR MORE Salmon River guide Steelhead and Salmon Fishing. Salmon River Drift Boat Fishing with your Salmon and Steelhead Salmon River Guide. There is a drift boat seat reserved and waiting for you.…… This Salmon River Guide drift boat fish catching machine awaits you. The Salmon River Guide Drift Boat allows you to Spin Fish or Fly Fish a great deal of water for Salmon or Steelhead. Often when the Steelhead or Salmon are scattered, the drift boat is a fabulous water chariot to get you to the best fishing spots quickly. We can either spin fish or fly fish from the drift boat. Or many times its best to get out of the drift boat and wade fish a productive run for Steelhead or Salmon with this Salmon River Guide. Out on your 16 foot heated Salmon River Guide drift boat. Enjoying a Fish filled day during the Fall, Winter and Spring on the Salmon River in Pulaski NY. Enjoy a Scenic drift boat trip down the Salmon River. Fun and Fast - Covering 4 miles in 4 minutes during the Fall and Winter. FOR MORE Salmon River guide Drift Boat Fishing. The Life of a Successful Salmon River Guide drift boat fishing for Steelhead and Salmon in Pulaski NY. (About Randy Jones the Yankee Angler). by Morgan Lyle For The Daily Gazette. Want an idea of the demand for a good “Full-Time” Salmon and Steelhead Salmon River guide? “I have already had to start scheduling my days off. A year in advance, believe it or not” said Randy Jones, aka, “the Yankee Angler”. One of only a handful of “Full-Time” Salmon River guides who take people Steelhead and Salmon fishing. From the start of salmon season in September right through to the end of steelhead season in the Spring. There are good reasons to envy the lives of a Salmon River guide. They make a living doing what the rest of us do for fun. Their workplace is a drift boat on a river, and their only boss is Mother Nature. But most fishers also realize it can be a tough life. One that could burn a person out on fishing altogether. Jones used to work every weekend and holiday. Now, because his Salmon River guide business is so successful and popular. He takes those days off and only guides mid-week. He’s in bed every night at 8 and up every morning at 3. All through the winter. Long before most people have clicked their remote car starters and sat down to a cup of coffee. He’s backing his drift boat trailer into the inky Salmon River in the frigid dawn in Pulaski NY. 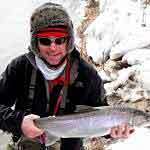 With anxious, bundled-up fishing client’s dreaming of leaping silver Steelhead. Even at the slowest times of the year. Salmon River guide Randy Jones is competing with dozens or hundreds of fishing anglers for fish. Steelhead are tricky to find, difficult to fool and very challenging to land on the Salmon River. When he’s not out with clients (some of whom have precious little Salmon or Steelhead fishing experience). He’s working on his fishing web site’s or lining up speaking engagements at Trout Unlimited functions and other gatherings that help promote his Salmon River guide business and keep his guide schedule full. “It takes an enormous amount of time and energy,” he said. “But what originally got me into the sport as an angler is still there. The love of being outdoors, the excitement of the Steelhead and Salmon fight, the challenge of it all. Basically just having a love of the sport that I haven’t lost after 35 years and sharing that passion with others, who have the same Salmon and Steelhead fishing interest’s as I do. Jones, 58, an Iowa native who lived and guided in Vermont and Cape Cod for 12 years before moving to Pulaski NY. May be one of the best-known of the hardy Salmon River guide corps. Randy has 35 plus years of experience as a fishing guide. Which has helped him to acquire a vast and diverse Steelhead and Salmon fishing knowledge base. While he’s relaxed and good natured with his clients, as a good Salmon River guide should be. He is also very much a hard-nosed businessman, always on the lookout for an advantage or a new way to promote his Salmon River guide service. 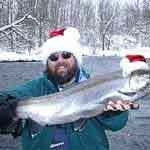 His Social Media sites offer expert Salmon and Steelhead Salmon River guide fishing informative articles. Based on Jones’ years of daily guide experience on the Salmon River. 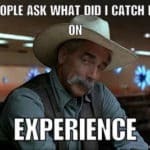 About flies, spin fishing, fly fishing, float fishing, rigging, techniques, fishing habitats and finding fish. As free as he is with general spin and fly fishing advice. Jones keeps things like Steelhead and Salmon honey-holes and productive bait, bead and fly-patterns secret, to be shared only with his fishing clients. He doesn’t waste a client’s time on a Salmon River hole that was pounded the day before. And he watches each cast carefully. To make sure the sport has covered a good fishing lie thoroughly before moving on. Most of Jones’ clients seem to land Salmon and Steelhead. But of course, there is more value to fishing with a Salmon River guide than simply being chauffeured to a good fishing spot in a heated drift boat. You learn things it would have taken you years to learn by yourself and you can come back confident and informed on your own. What’s it like to be a Salmon and Steelhead Salmon River guide? “It can be a variety of different things. From total satisfaction that you’ve taken someone with lots of Salmon and steelhead fishing experience to no fishing experience. And brought their fishing ability level up to meet their expectations or above. The same way a teacher would feel when their students get an A on a test. To the thrill and the excitement of the Salmon or Steelhead fight. The rewards of running a profitable Salmon River guide business. To sometimes the feeling of inadequacy when you have a slow fishing day on the Salmon River,” he said. Jones can be reached at (315) 963 – 2065. Along with his own Salmon River guide fishing business, he offers a referral service to 6 other local top fishing guides. That he keeps busy while taking his client over flow. The Schenectady Gazette.,Schenectady, NY. All rights reserved. Reprinted with permission. Salmon River Guide – 3 Prime fishing ways to locate the MOST Salmon River Steelhead and Salmon for Your trip! 1. When the Salmon and steelhead are running the Salmon River. Fish there “Temporary Transitional Resting Spots” as they make there way up the Salmon River. Otherwise, you are fishing to Salmon or Steelhead that are not stopping, decreasing your odds greatly. Tutorial Video on Temporary Transitional Resting Spots. 2. Once the Steelhead or Salmon stop running the Salmon River to hold during the middle of the day. – (From approx. 9:30am. to 5:30pm.) Fish these “Prime Transitional Holding Spots”. Tutorial Video on Prime Transitional Holding Spots. 3. Once the Salmon or steelhead have stopped running the Salmon River. And have found a spot that satisfies all their survival instincts. Fish these “Prime Holding Spots” – (Pools). Normally, the most fish and they aren’t going anywhere soon. Tutorial Video on Prime Holding Spots – Pools. I hope you catch a BUNCH! Salmon River Guide Randy Jones. 4 Advanced fishing ways to locate and target Your Salmon River Salmon and Steelhead from this Salmon River Guide. 2. Combine all of the above and find a spot above a looong stretch of rapids. The fish get tired after running these Salmon River rapids and will hold here for an extended period of time. 4. My #1 Spot! Combine all of the above and pick a spot that compresses and or concentrates them. On a dime, like a sardine can, trash can lid or the size of a Volkswagen beetle or bus. This cuts down on all the guess work. And it allows to to present your offering to all the Steelhead and Salmon on every drift. By utilizing the above. You will have the most Steelhead or Salmon in front of you for the greatest period of time. In a concentrated area offering you the greatest opportunity to present your offering to ALL of them. Fish ON and ON and ON! Now you know what “This Salmon River Guide” look’s for normally. I hope you found my “Salmon River Guide Tips” entertainingly informative or mildly educational. – May all Your door knobs smell of BIG Salmon and Steelhead! Best Fish’s, Salmon River guide Randy Jones. Salmon River Guide – BEST FISHING MONTHS. For Chinook (King Salmon), Coho Salmon, Steelhead, Atlantic Salmon and Brown Trout. The following Salmon River fishing Months and Species are general and depend on temps. and water levels. June – August Salmon River fishing. Skamania (a summer run strain of Steelhead.) Atlantic Salmon in small numbers. Chinook (King Salmon) also start to show as early as July on high water. But number’s grow with good water conditions in late August. 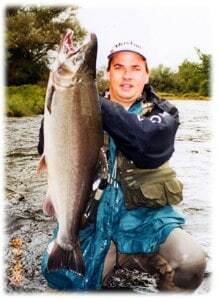 September Salmon River guide fishing – Chinook (King Salmon) and Coho Salmon start coming in in good numbers on the Salmon River. Steelhead start coming in in decent numbers. A few Brown Trout start showing. 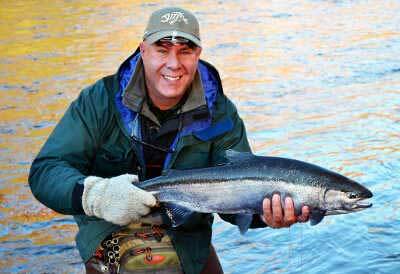 October Salmon River guide fishing – This is the prime month for fishing Chinook-King Salmon. They come in in large numbers now. Coho Salmon are also coming in in good numbers. Steelhead really begin showing in good numbers now. 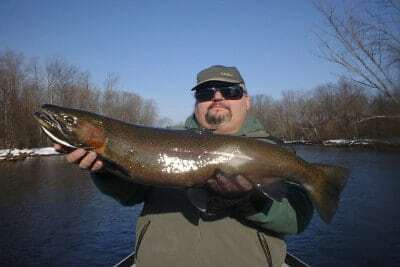 Brown Trout also start coming in, but Nov. is peak for them on the Salmon River. November – Dec. Steelhead and Brown Trout fishing on the Salmon River. Most of the Chinook King Salmon are dead or near dead but a few fresh stragglers do come in. While the Coho Salmon run is over for the most part. This is a great time for Steelheaders! The numbers of Steelhead are normally good. Brown Trout are around, although not as good as tributaries more to the west. 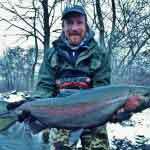 Dec – Feb. Salmon River fishing. The fishing can be great for Steelhead depending on water temps and levels on the Salmon River. Brown Trout are often caught this time of year as well. March – April fishing for Steelhead on the Salmon River. The water starts warming and the Steelhead start coming in in greater numbers. The spawn begins as the temps rise and often a small run of Brown Trout come in to feed on bait fish and Steelhead & Sucker eggs. Don’t be surprised if you hook a Chrome Steelhead freight train that takes you for a ride! This is a GREAT time to target drop-back Steelhead on the Salmon River NY! These are spawned out Steelhead who are now eating everything in sight. As they work their way back to Lake Ontario. The numbers of Steelhead caught in a day at this time of year can be amazing. May Salmon River fishing. Usually some Drop Back Steelhead still around. Great time to fish if you enjoy solitude on the Salmon River. The first Skamania and Atlantic’s can be caught at this time as well. Credit – Jeff Pierce of https://www.scientificanglers.com/. 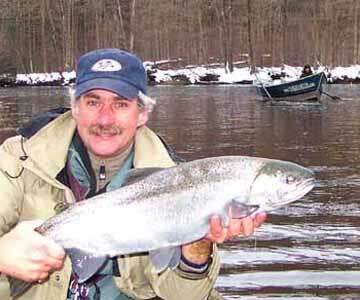 Salmon River Guide – Fishing the Salmon River in Pulaski New York for Chinook (King Salmon), Coho Salmon, Steelhead, Atlantic Salmon and Brown Trout. The Salmon River in Pulaski NY is located in Oswego County. And stretches 17 miles from the Lighthouse Hill Reservoir in Altmar. To where it empties into Lake Ontario at Port Ontario. There are 12 miles of Public Fishing Rights along the Salmon River. 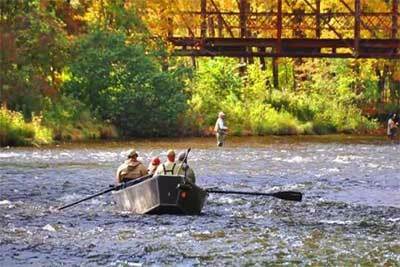 The Salmon River offers some of the finest sport fishing in the country. Two major fish records have been set in the Salmon River. The Great Lakes record Chinook King salmon (47 lbs. 13 oz.) and the world record Coho salmon (33 lbs 4 oz.). General Salmon River Guide Fishing Information. Chinook (King Salmon) and Coho Salmon Fishing with this Salmon River. Maturing Chinook (King Salmon) and Coho salmon return to the Salmon River. They begin to stage off the Salmon River mouth in late August. Chinook (King salmon) are the main attraction this time of year. They range in size from 15-30 lbs., averaging around 18 lbs. Coho salmon are generally smaller and range in size from 3 to 10 lbs., averaging around 8 lbs. Trolling in the estuary with spoons, dodgers/flies, cut-bait and plugs works well for these staging fish. Salmon usually begin entering the Salmon River around Labor Day. 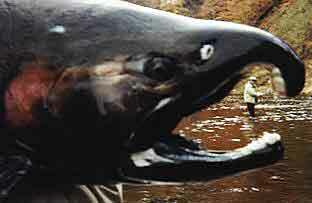 Once King and Coho Salmon enter the Salmon River they are no longer actively feeding. Despite this, the King Salmon and Coho Salmon do exhibit behaviors that make them vulnerable to traditional sport spin and fly fishing techniques. One of these behaviors is aggression, or territoriality. And the other is their attraction to fish eggs or egg shaped lures. The peak of the King and Coho salmon spawning run. Usually doesn’t occur on the Salmon River until the latter half of September and the first half of October. King and Coho Salmon are generally spread throughout the Salmon River depending on the spawning stage they are in. Some King Salmon and Coho Salmon will be making their way up the Salmon River. Often referred to as running. Holding in deeper pools and actively spawning. Fish engaged in the first two activities can be caught on egg sacs, egg imitating flies or plastics and streamers. King and Coho Salmon that are spawning, especially the male Salmon. Can become very aggressive and will strike gaudy streamers swung past their spawning redds on the Salmon River. Salmon River Steelhead Fishing – Chambers Creek Steelhead and Skamania steelhead. New York State stocks two strains of steelhead in the region. Both strains are derived from stock taken from the Pacific Northwest. They are commonly referred to as “lake run rainbow trout” and are anadromous, which means they migrate into streams to spawn. Steelhead can survive the spawn and may return to the Salmon River multiple years to spawn. The strain which is stocked in greatest numbers on the Salmon River and which has been stocked the longest is known as the Chambers Creek winter run strain. They begin entering the Salmon River in mid to late October. They often hold in the rivers until April and sometimes into May. Often warm weather and high water flow triggers another run of Steelhead into the Salmon river. Most winter run steelhead are ages three, four or five. These Steelhead average 7 to 12 pounds in the rivers and streams. 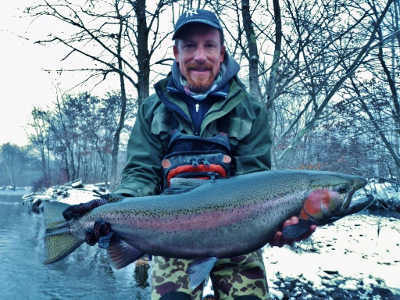 The state record steelhead (recorded as a rainbow trout) was taken in 1985 and weighed in at 26 pounds and 15 ounces. Winter run steelhead spawn from mid-March through April on the Salmon River. 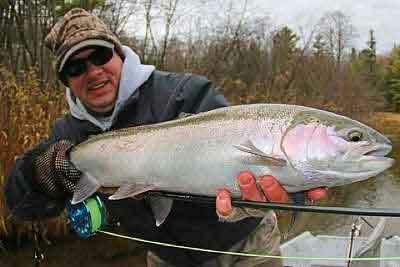 Skamania steelhead are newer to the region, and are “summer run” steelhead. Although they too spawn in the spring, they are bred to run in the Salmon River during the spring and summer months. This program is relatively new and its success is still being evaluated. It is hoped that with the stocking of Skamania steelhead, and the more consistent Salmon River water levels during the summer mandated by the recent relicensing. 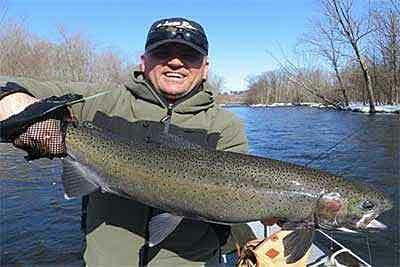 There could be a viable fishery for steelhead during the summer, together with Atlantic salmon and native brown trout. Skamania steelhead first return at age three, and four year olds dominate the runs. Salmon River Atlantic Salmon Fishing. Atlantic or landlocked salmon were once native to Lake Ontario and the Salmon River. Since 1996 there have been serious efforts to reintroduce this species into the Salmon River. However, they seem to be more susceptible to adverse conditions and their survival rate has been lower than the other salmoniods stocked in these waters. 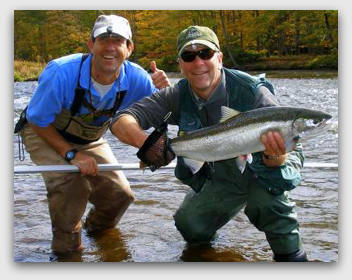 Atlantic salmon run the rivers from June through November. They spawn in the fall, generally later than chinook salmon. Since they are summer runs, they provide an opportunity, along with the Skamania steelhead and native brown trout populations, for a summer fishery in the Salmon River. Like steelhead, Atlantics often survive the spawn to return another year to the Salmon River. Adult Atlantics average from 12 to 30 inches in length. The state record was taken from Lake Ontario in 1997 and weighed 24 pounds and 15 ounces. Salmon River Brown Trout Fishing. The Brown trout enter the Salmon River from mid-September to mid-November. Brown Tout are also on a spawning run, but will feed heavily on salmon eggs. It can be difficult to target brown trout on the Salmon River. But one option is fishing down stream from actively spawning salmon with egg sacs and egg imitating flies and plastics. Brown trout range from 2 to 20 lbs. on the Salmon River. Brown Trout are not generally anadromous and therefore do not regularly run the rivers like the salmon and steelhead. Nonetheless, some brown trout from Lake Ontario make their way into the Salmon River and are taken, usually later in the fall along with steelhead. The DEC is also attempting to develop a population of resident Salmon River brown trout, to provide a summer fishery. It is hoped these resident brown trout would be in the 15 to 18 inch range during the summer months. Lake run browns, which lived in the lake and made their way into the river, can be large and in the Salmon River they average 7 to 8 pounds. They spawn in the fall. 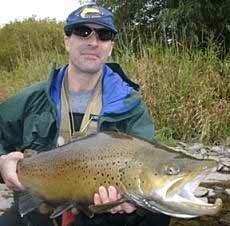 There is also typically a run of brown trout in the Salmon River in late June or early July. Salmon River Fisheries Management – The five major game fish are. Chinook (King Salmon) and Coho Salmon, Atlantic Salmon (or landlocked salmon), Brown Trout, and Steelhead. Smallmouth Bass are also found in the Salmon River in Pulaski NY. The Salmon River is stocked yearly with around 300,000 Chinook salmon. 80,000 Coho salmon. 120,000 Washington strain steelhead. 40,000 skamania strain steelhead and 30,000 Atlantic salmon. Natural reproduction does take place on the Salmon River in Pulaski NY. But to what extent this adds to the Salmon River fishery is not known. 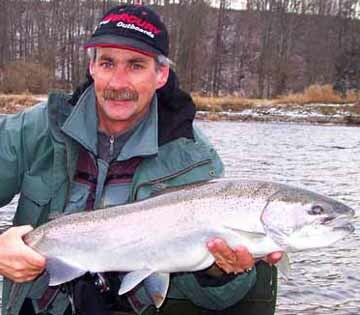 The Salmon River is an important part of the Lake Ontario salmon and steelhead fishery. Some of the returning salmon and steelhead to the Salmon River make their way to the Salmon River Fish Hatchery in Altmar. These fish are then used for egg collection. And the resulting Salmon and Steelhead are stocked into many Lake Ontario tributaries. Along with the Salmon River in Pulaski NY. A total of 1.76 million Chinook King salmon are stocked annually by NYSDEC into Lake Ontario. Credit – http://www.dec.ny.gov/outdoor/37926.html. Salmon River Guide Steelhead and Salmon - Related Content. 1. Want a Good Laugh? Enjoy my Salmon River Guide Humor. 2. 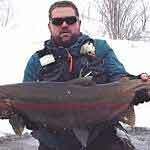 Gigantic - Galvanic Steelhead Story! 3. Join the 10% of the Salmon River anglers that catch 90% of the Salmon and Steelhead club! John’s honk’a off the drift boat! Approx. 16 lb. Steelhead!